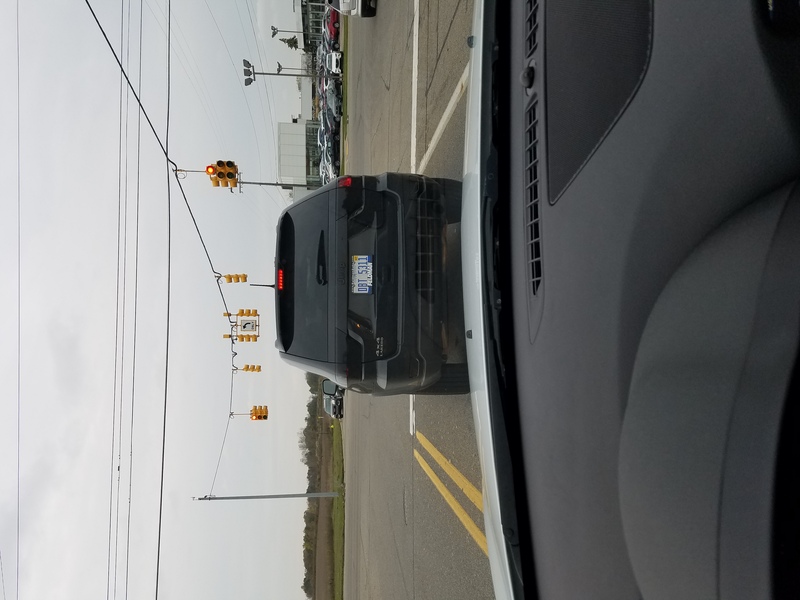 These darkened taillights are quite obnoxious if done incorrrectly since you can barely see if they are illuminated or if the driver has applied the brakes. Overall I do not care for them and hope the fad dies out. 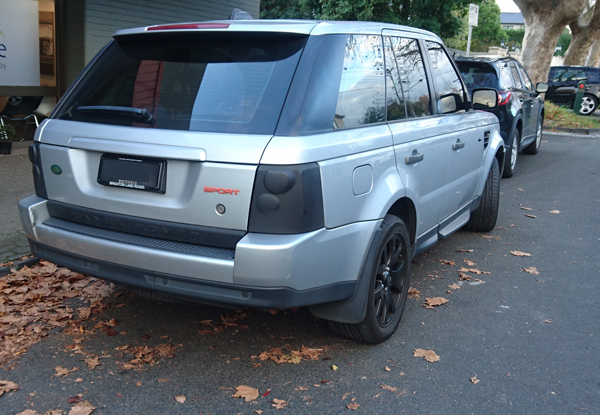 What exactly happens in regard to your own liability when you rear-end a vehicle like this in part because they darkened their tail lights to the point that the light output is diminished? I’m hardly the most pro-regulation guy out there but don’t think this should be remotely legal and should in fact be enforced by the police outside of regular inspection channels, whatever those may or may not be depending on a given location. I’m not talking about factory tinted taillights that I assume still produce enough light to conform to whatever regulation is in place but something like the above…Stuff like this being allowed to drive around is what makes self-driving and self-controlled cars more attractive, there is enough stuff to pay attention to already without people actively making themselves less noticeable to other traffic participants. Too bad there’s no pic of the front, I can see this guy having blacked out his headlights too. That is one reason I will be getting a dash camera…the fact that other cars often have inoperable / incorrect / un-used lighting. Interesting idea for the camera! Never thought about it but that’s a damn good point. I plan on getting one too. That’s too weird. 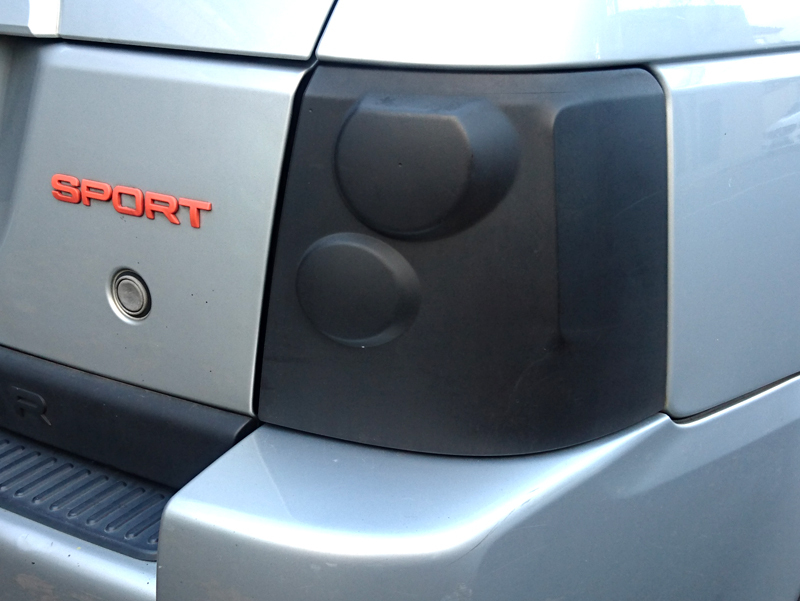 I suppose this type of taillight cover could be any color, even the body color? As LEDs take over lighting and covers like this become available, it frees up the stylist to completely hide the head and taillights. With electric power eliminating grilles and tailpipes, a car’s front end and rear end could be completely featureless, or with any features the stylist wishes. I expect we’ll see this done well and we’ll see it done terribly. It is amazing that people will spend money on such foolish useless sh!T. THE MOST IDIOTIC AFTERMARKET ADD-ON, EVER!!! ..ahem..Ok, I’m better now. Never, ever, understood how this was even legal. I have always cringed when I see it on vehicles, especially motorcycles. You really want people to NOT see your tailights??? You really want to severely cut down your headlights ability to illuminate the road in front of you?? Really?? Hey, why not go all “brass era” and have one tailight, and gas powered headlamps. And then “slam” the suspension to make it all but undrivable. Now you’re bad-assed! And a prime candidate for a Darwin Award! All the covers that I have seen in the past say “For off road use only”. They aren’t legal, but neither is jay walking and it happens everywhere all the time. The chances of getting a ticket are slim. But I would be nervous every time I drove the car being worried I would be pulled over. Yep. I don’t jaywalk because it’s illegal, I don’t jaywalk because I don’t particularly want to get run over. It’s just common sense. I don’t want to get rear ended because someone couldn’t see my brake lights. That must be lights made by Lucas, The Prince of Darkness. Personally I think stuff like this says more about the attention – seeking fragile ego of the car-owner than anything else. It makes no sense to reduce the function of components and possibly draw the attention of the cops, through excessive custom touches, whether its excessively dark tinted widows, lights, license covers, excessively loud exhaust etc. I nearly rear-ended a Dodge pickup this morning with this type of blackout cover. I’m a reasonably defensive driver, and try to keep a reasonable distance from cars in front of me, so luckily I didn’t run into it. 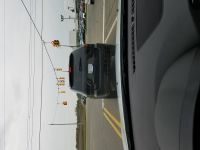 It turned out that the truck in front of me had only 1 working brake light out of 3. I’ve noticed a few late model cars that have smoked tail lights (like Camaros), and under certain lighting conditions the brake lights are hard to see when the driver puts on the brakes less than full force. In Michigan it is illegal. In MOST states, it’s illegal. But nobody cares and it’s seldom enforced, so the scofflaws do it anyway. High-mounted light works, and one of the regular taillight bulbs works, that’s it. The whole problem is lack of enforcing safety standards. Personally, I want others to see my lights. Winter is the worst- people don’t clear their glass area or front and rear lights. And in Mass, there’s a law that your lights have to be on when ever you have to use your wipers continuously- and 90 percent of drivers are unaware or ignore it. Thought of that immediately, and was looking to see if anyone else had beat me to it! These would be in violation of transport regulations anywhere. As ridiculous as darkened headlight covers. All well said, gents! We have seen and still see in our area, mysterious little blue lights and little green lights on dashboards. When flashing, these mean volunteer fireman and volunteer emergency medical services personnel. Still, auto stores sell this garbage which confuses drivers. I have also seen headlight surround inserts or a certain JEEP that come in amber (okay), green, blue and red all three of which are not okay. In the early 1950’s when some cars had uniformly round taillights, auto parts stores were selling a blue crystal like 3.0 centimeter round glass that was held to the tail lamp by the tail lamp bezel. This idiotic device at distance sowed as purple. Another stupid lighting device in an ear when tail lamps were remarkably less visible without this nonsense. Law enforcement has to pull these people over and ticket them nd follow through on the summonses. You are right that it is for the driver’s ego – which must be from a remarkably small mind. Remember the little round blue lens, the size of a big marble, that you could put in the middle of your tiny ’39 Ford taillight, to make it . . . different from stock ? There is a terrible disease affecting many people nowadays. Chronic Assholism. It affects many, and it appears that the owner of this SUV is a sufferer. Without intervention, he or she may progress to Terminal Assholism, with certain death the only result. in pictures those look remarkably like hard black plastic. Now the CHMSL stands out even more. I’ve been there when the likes of this nitwit have put forth, with a straight face, “It’s a one-way tint, so the light isn’t affected”. That’s whole orders of magnitude more stupider than “Well, some cars have dark lenses from the factory, so it’s fine”. I’ve not seen this in the UK, and I hope I don’t. Not for me. Apparent safety issues notwithstanding, the colors and shapes in the taillamp lenses are part of what makes the rear of a car interesting. “Improvement by subtraction”? Nope. Not here. I remember the sheer disappointment as a kid of buying a toy Matchbox car that looked cool in profile in its box, only to find out it had generic taillights / headlights that were molded from the same, unpainted piece of potmetal that formed the “chassis”. In fact, the initial photo looks just like the lens had been painted with satin latex house paint. Odd . . . There is a specific paint sold just for this use, product blurb below. Completely illegal, but it would probably take getting pulled up for something else to get a ticket from the police for it. Darkened lights get you pulled over round here then the cop gives you and your vehicle the third degree and they will find a reason to put it off the road. I’ve never understood the attraction to these add ons, and I haven’t seen a single vehicle that they look good on. On the plus side, those covered headlights are about the only ones on modern vehicles that don’t blind me at night even when dimmed. On the bad side, can they see me? That crap needs to be a towable offense, it’s ridiculously unsafe and should not be tolerated in the least. I’ve seen vehicles with lights blacked out like that at night and even the brake lights are barely discernible on unlit roads. The PO of my ’96 Tacoma glued slotted ‘grilles’ on the tail-lights. The lights show bright through the slots and it passes the annual inspection. The third brake-light is unobstructed and works just fine. I did get a pair of un-altered lenses at Pick-N-Pull – but think I’ll wait until someone cracks one of mine. I don’t like to sound like a complete Kevin French, but please consider rethinking this one. Yes, you can see the lights shining through the slots…if you happen to peer at the lights from an angle not blocked by the grilles. State inspections are pretty much just “Yep, I see ’em light up, so they’re fine”, but that’s because they’re assumed to meet the Federal Motor Vehicle Safety Standards, which specify all lighting functions in elaborate detail as to how much light they have to put out through a large range of horizontal and vertical angles. That’s so they can be clearly and immediately seen and understood by the drivers of the similar Tacoma behind you, the semi tractor in the next lane over to the left, the Corvette driver coming up the on-ramp to the right, and everyone else populating that giant range of angles. Moreover, there are requirements for minimum lit area for the brake lights and turn signals. Those grilles the PO affixed surely reduce the safety performance of the lights they’re on, almost certainly well below the required values. Maybe not quite as dumb as spraying black paint on the lamps, but the idea is the same, and it really isn’t enough that the light shines through the slots in the grille. Will you please swap in the unobstructed lenses? The sheetmetal and expense you save will include your own, and you’ll be depriving insurance companies of an easy reason for denying a claim. Well, the slots are about 1.25″ by 3″, flush with and wrapped around the lenses horizontally, so the tail-lights are still brightly visible at all angles. The ‘divider-bars’ are about 1/2″ wide. They kind of resemble brush-guards, except for being plastic instead of metal. If they were ‘slits’, I’d have changed them already.